Psoriasis is a skin disorder that affects millions of Americans – but what causes it, and can it be treated? Here we explain a person might get psoriasis, and what to look for if you think you might have it. What “Activates” Psoriasis and Makes It Worse? Psoriasis is a skin disorder that affects as many as 7.5 million Americans. It results from malfunctioning skin cells that reproduce much faster than normal, leaving thickened, raised patches of red, scaly skin. There are several types of psoriasis, with the effects ranging from mild to severe and disabling. Sadly, there is still no cure for psoriasis, but don’t be completely dismayed: There are things you can do to decrease the frequency of the outbreaks and perhaps even experience periods of clearing. Psoriasis is a chronic recurring skin disorder, identified by the presence of thickened, scaly areas and papules (small, solid, often-inflamed bumps that, unlike pimples, do not contain pus or sebum). 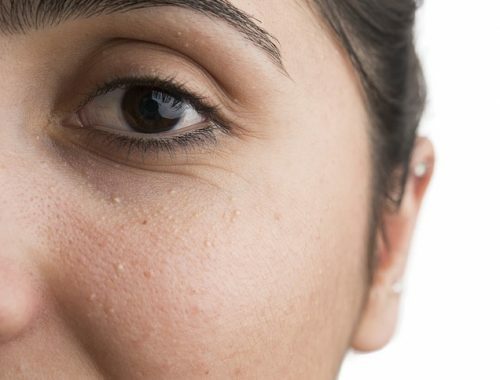 These bumps are usually slightly elevated above the skin surface, and are sharply distinguishable from normal skin by their often red to reddish brown color. They usually are covered with small whitish or silver scales that stick to the cyst-like swelling and, if scraped off, may bleed or ooze. For some people, psoriasis may be nothing more than a few small, scaly patches at the hairline or on the sides of the nose; for others, the disease can cover the entire body. Most typically, the elbows, knees, scalp, and chest are afflicted. A person can develop psoriasis regardless of skin type; someone with oily skin is just as likely to suffer from it as someone with very dry skin. Despite the vast number of people struggling with psoriasis, fewer than 2 million seek medical treatment. That’s a shame, because the medical treatments are getting better all the time! Plaque psoriasis is the most common, and the type most typically associated with the disorder. It’s characterized by raised red patches of skin covered by thick silver-white scales on various parts of the body. Guttate psoriasis appears as small, red, dot-like lesions that can cover the entire body. Guttate psoriasis has been known to occur following a strep infection. It most commonly occurs in children and young adults. Inverse psoriasis shows up as red lesions that develop in the folds of the skin on the body, such as in the armpits or behind the knees. According to the NPF, many people who have this form also have another form of psoriasis at the same time. Pustular psoriasis most often occurs on the hands and feet and consists of white pustules surrounded by red skin. The pustules are not infectious, but rather contain white blood cells. Erythrodermic psoriasis is the most rare and most severe form of psoriasis, where much of the body is covered in inflamed, red skin. The inflamed skin can come off in sheets; think of massive peeling after a sunburn. If a person has this type of psoriasis, medical experts recommend seeing a doctor immediately at the first sign of a flare-up. No one knows for certain exactly what causes psoriasis and, as mentioned, there is no cure, although the latest studies strongly suggest it may be related to an immune system problem that triggers inflammation the body cannot control on its own. Research has shown that psoriasis is triggered by the activation of T-cells (a type of white blood cell). These cells affect the immune system and release cytokines (chemical messengers that stimulate the production of other substances, both good and bad substances). In people with psoriasis, these cytokines send faulty messages that tell skin cells to reproduce and mature at a faster-than-normal rate; this miscommunication leads to the visible lesions and scaling of psoriasis. A normal skin cell matures in 28 to 45 days, while a psoriatic skin cell matures in 3 to 6 days. As you can imagine, with too many skin cells maturing too quickly, things can really get out of control. Recent studies are leading researchers to believe that the misbehaving cytokines can also increase insulin resistance in the liver and muscles, and destroy insulin-producing cells in the pancreas, ultimately leading to the development of diabetes. In fact, there is now evidence that people diagnosed with severe psoriasis are nearly twice as likely to develop diabetes as those without psoriasis; those with mild psoriasis are more than 1.5 times as likely to develop diabetes. This news is particularly troubling because diabetes presents a whole separate set of skin concerns, including increased risk of bacterial folliculitis and fungal infections like ringworm. What can you do if you have psoriasis? As we mentioned earlier, there is no cure, but there are a variety of treatments that can help lessen its effects. Treatments range from topical creams to UV light therapy. Of the various therapies available to treat psoriasis, it’s generally best to start with those that have the least serious side effects, such as topical steroids (cortisone creams), topical vitamin D preparations, retinoids, salicylic acid, coal-tar creams, lotions, cleansers, shampoos, prescription topical medicines, and careful exposure to sunlight. If those treatment methods do not work for you, you can proceed to the more serious treatments involving oral medications. More often than not, successful treatment requires ongoing use of a combination of methods. Sugiyama H, Gyulai R, Toichi E, Garaczi E, Shimada S, et al. Dysfunctional Blood and Target Tissue CD4+CD25high Regulatory T Cells in Psoriasis: Mechanism Underlying Unrestrained Pathogenic Effector T Cell Proliferation. J Immunol. 2005 Jan 1; 174(1): 164–173. Armstrong A, Harskamp C, Armstrong, E. Psoriasis and the Risk of Diabetes Mellitus: A Systematic Review and Meta-analysis. JAMA Dermatol. 2013;149(1):84-91. Al Robaee, A. Molecular genetics of Psoriasis (Principles, technology, gene location, genetic polymorphism and gene expression). Int J Health Sci. 2010 Nov; 4(2): 103–127. Heller M M, Lee E S, Koo J . Stress as an influencing factor in psoriasis. Skin Therapy Lett. 2011 May;16(5):1–4. Raychaudhuri S P, Jiang W Y, Raychaudhuri S K. Revisiting the Koebner phenomenon: role of NGF and its receptor system in the pathogenesis of psoriasis. Am J Pathol. 2008 Apr; 172(4):961–71. Mallbris L, Wolk K, Sánchez F, Ståhle M. HLA-Cw*0602 associates with a twofold higher prevalence of positive streptococcal throat swab at the onset of psoriasis: a case control study. BMC Dermatol. 2009 May 29; 9:5.